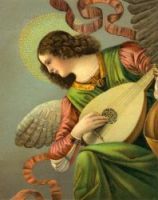 The word Angel signifies messenger in both the Hebrew and Greek, and is used to denote whatever God employs to execute his purposes, or to manifest his presence or his power. In some passages it occurs in the sense of an ordinary messenger. In others it is applied to prophets, to priests, and to ministers of the New Testament. It is also applied to impersonal agents, as to the pillar of cloud, to the pestilence, and to the winds. But the name Angels is more eminently and distinctively applied to certain spiritual beings or heavenly intelligences, employed by God as the ministers of His will and usually distinguished as angels of God or angels of Jehovah. In this case, the name has respect to their official capacity as "messengers," and not to their nature or condition. In the Scriptures angels appear with bodies, and in the human form, and no intimation is anywhere given that hese bodies are not real, or that they are only assumed for the time and then laid aside. It was manifest indeed to the ancients that the matter of these bodies was not like that of their own, inasmuch as angels could make themselves visible and vanish again from their sight. But this experience would suggest no doubt of the reality of their bodies; it would only intimate that they were not composed of gross matter. This gallery of Angels are from my collection of postcards, old books, and magazines. Feel free to use any of these Angels in your artistic creations. Click on the Angel images below to see more details about saving a free image or about purchasing one of these Angels at a higher resolution.